Just about every week, Caitlin is kind enough to bring flowers from her garden for my desk. On Monday, she came in with this gorgeous bouquet of roses and irises. I’d brought flowers that day too. 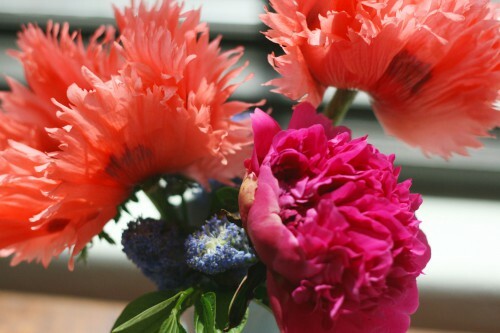 Mine were poppies and a peony from my garden. 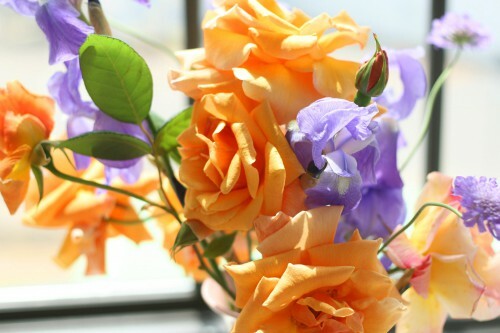 I love having flowers around the studio every week in the Spring, and the roses were particularly fragrant. We’ve been working on the Fall patterns this week. The designs are actually finalized and drafted already, and I’ve been slaving away on grading them the last few days. 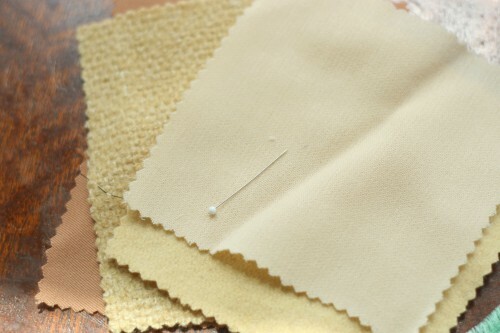 You know how we all have those aspects of sewing that are sort of a drag? Maybe it’s buttonholes, or zippers, or cutting out the pieces. Well, I have that with patternmaking too, and the dreaded boring task is grading. It’s just so dull. Luckily, there have been fun things to do too. We’ve been playing with swatches and coming up with some palettes. 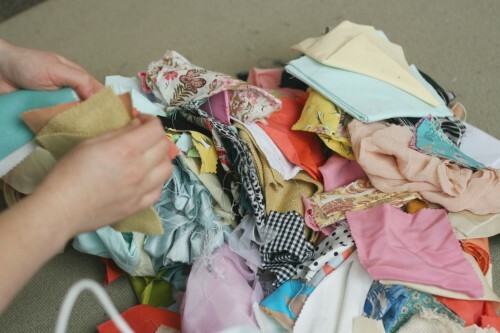 Above is a mound of fabric scraps that we have leftover from another project. We used them to get some ideas about color and types of print we want to use. We’re still nailing down the color story and trying to figure out what sort of prints to work in. We’re leaning toward some pastels with black and camel, but I’m sure that will change. Caitlin is very good at using what we already have, and working old and new fabrics in together. 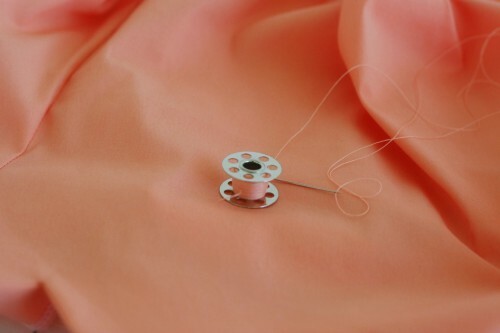 We tried out some gorgeous mint green silk that I had by draping it on a dress form. What do you think about it? I love mint green and black together, but Caitlin is worried it can go a little cutesy or costumey. 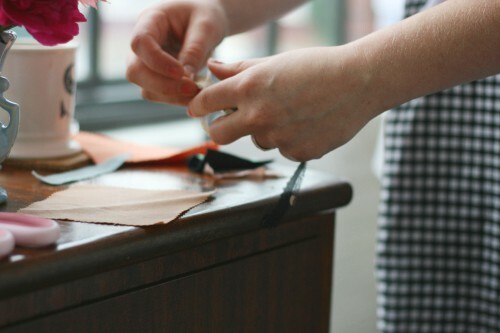 And here’s a little snippet from a tutorial Caitlin has been working on for modifying the Sorbetto top. We’ll share that one soon. Other than that, I’ve been working on some fun ideas for the future that I’m really excited about. It’s always a challenge for me to balance all of the ideas with the stuff that has to be done on schedule (like those Fall patterns). I kind of like the green with the black. And the flowers are lovely. I fill my house with flowers all the time too. It just makes me happy. Flowers are the best pick me ups out there. I feel like here in Portland, all the flowers are our reward for the long hard winter. I love all those flowers. If only some clever person would come up with poppies and peonies that flower for several months of the year! Thanks for making Sorbetto pattern available as free download. Oh, I know! We now have three peony bushes. The first one bloomed, produced gigantic red flowers, and then all the petals dropped after the first hard rain. That’s life, I guess. I love hydrangeas! We have some in the front yard, but they aren’t blooming yet. And we have vining hydrangea in the back, which is all pretty and lacy now. I like mint and black too! To me it’s very sharp and 1920s, sort of. But the dress we’re planning it for has a more audrey hepburn vibe. I have been sewing for so long. I’ve just started drafting my own patterns, and the only real mystery left for me is grading. Any chance you would do a tutorial to show us some basics? Hmm, I think we could do that. Maybe a tutorial about grading at home and some general principles? Grading is a very complex subject, so I could see it being difficult to tackle in the format of a blog. We’ll mull that one over! Can’t wait to read the sorbetto tutorial! I think I understand Caitlin on the mint green, since black tends to make any other color a bit dramatic or flashy (to me, at least). Why not a more subtle hue like ivory? Yes, we talked about ivory as well. I think we need to work on this palette a bit more. Yeah for FALL PatternS….I do hope it is more than one :-) I love your stuff! Yep, definitely more than one! Hooray for fall patterns! You know the only reason I haven’t snapped up all of the Colette patterns is because I know there are beauties on the horizon (and I’ve a limited pocketbook, otherwise I’d just hoard). So excited! :) I finally cut into my Rooibos pattern, which I’ve had for months, such a great dress for summer. A few fitting things, but such excellent design and instructions. Thanks Ali! Rooibos is such a cute pattern. Still one of my favorites. I love green, and I like that the mint green isn’t a color you see around much, but I do agree with Caitlin. I think you just have to be careful with it – I think the black grounds it a bit, but I think I’d like the mint better as an accent. Kind of like the way you use mint in cooking, actually… Hard to say without knowing any details ;) but I’d like it as maybe a bodice or a skirt, or just a sash. With the right garment, though, it could work. Haven’t tried any of your patterns yet, but I’m thinking fall might be a good time to pick one up… looking forward to seeing what you do. I love seeing these little glimpses of the process. Glad you’re enjoying the peeks at what we’re doing, we’re trying to remember to document things more for everyone to follow along!